It is a foul bird that fills his own nest. The Green Kingfisher, Chloroceryle americana, is a resident breeding bird which occurs from southern Texas in the USA south through Central and South Americal to central Argentina. 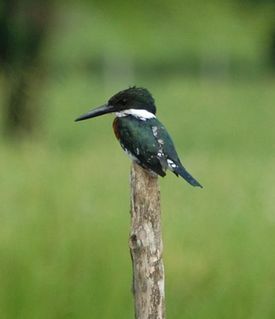 The Green Kingfisher is smaller than other kingfishers and lacks blue-gray coloration. This small kingfisher breeds by streams in forests or mangroves. The nest is in a horizontal tunnel up to a meter long made in a river bank. Fish is their prey. They also eat aquatic insects. bird proverb, Chloroceryle americana, Green Kingfisher, It is a foul bird, It’s an ill bird, Nest. Bookmark.